One of my highlights for the year was to be invited to an exclusive Whet Your Appetite dinner at Huxtable - A Brave New Culinary World for the Electrolux Appetite for Excellence Awards 2013 featuring the cream of Australian culinary talent from across Australia. Sydney and NSW food identities featured highly in the Awards. It might be cliche to say the future of the food industry looks bright but it's true. I'm a huge fan of Daniel Wilson (ex winner of this award) and Huxtable (not to mention Huxtaburger) as a foodie haven. So this event was much anticipated! The Whet Your Appetite dinner was like being at the perfect restaurant. We were served by waiters who were finalists in the Awards. They were full of class, poise and were engaging - service perfection. We were served up cuisine by Australia's top young chefs - and every course was to rave about. And we enjoyed our meal alongside Australia's finest young restaurateurs. The Awards are highly presigious with a judging panel that included Australia's most influential food identities Luke Mangan, Christine Manfield, Lucy Allon and Mark Best. Also a big part of the evening was glamorous ambassador Rebecca Varidel from InsideCuisine. The finalists had gone on a tour of culinary South Australia for a couple of weeks visiting farms, restaurants, wineries and the like. What a gig! The culinary tour was a showcase of talent to the foodie world as well as being of educational benefit to the finalists and forging of bonds. I could tell there was a slight tension as the finalists waited for the Awards to be announced (the next night at the Hilton on the Park). I enjoyed the inspiration of James Viles (left) a Chef and Restaurateur from Biota in Bowral NSW who worked for many years in the Middle East but now owns and cooks at a highly acclaimed modern Australian restaurant. This guy is in his early 30's and has loads of experience in premium culinary destinations. 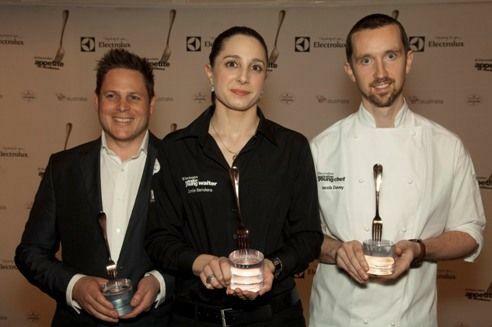 James was announced as the Electrolux Australian Young Restaurateur of the Year 2013 - congrats! I also was inspired by Stewart Wesson last year's winner from Public in Adelaide. Stewart has bedazzled corporates in Adelaide for his fine dining lunches and innovative cooking. I enjoyed a conversation with Julia Paussa from Coast Restaurant and Bar in Hervey Bay, a Young Restaurateur finalist with one of Queensland's most acclaimed restaurants. Julia is a go-getter passionate about her region and about shared dishes and quality culinary events hosted by Coast Restaurant and Bar. Another highlight was to chat with Sonia Bandera the Sommelier from Rockpool Bar and Grill, a total professional who prides herself on her passion and knowledge of all things wine and a love of customers and service. Sonia was deservedly named Electrolux Australian Young Waiter of the Year 2013 - congrats! Marque Sous Chef Jacob Davey has developed his own reputation working for Mark Best in an iconic Sydney restaurant. He remembers the shift from Edith Piaf to The Smiths (yeah baby) during his time at Marque. Jacob Davey was announced as Electrolux Australian Young Chef of the Tear 2013 - congrats from The World Loves Melbourne! Davey believes the key to becoming a great chef relies on "a creative mind, the constant desire to learn, the will to teach and ability to manage people, communicate and to work clean and be organised". "Most importantly, you must have a passion for food and cooking." he said. Seriously, this was a culinary highlight of the year. Mooloolaba big eye tuna, horseradish, shiso, daikon and mizuna salad was a sensation and a favourite dish of many. It was prepared and cooked by finalists Hajimi Horiguchi and Breanna Lawler and served with Chikuma Nishiki "Kizan Sanban" 2012. Delectable tuna with freshness of salad and kick of daikon and horseradish and shiso herb complementing. The Lamb belly, turnips and sheep's milk yoghurt was prepared by Jacob Davey and Danielle Doffay. This dish was again sublime with interesting balls of turnip and yoghurt on a bed of succulent lamb. Again, the balance of this dish was amazing with yoghurt and turnip cutting through the lamb. Served with Port Phillip Estate Pinot Noir 2011 this was a triumph. In a sea of amazing dishes I loved the Western plains pork belly and cheek, buckwheat, prunes, hazelnuts and wood ear mushrooms, served with Black Pony by Oliver Gould and Mitch Jones. I could eat this all night - and pretty much did. Even though I gravitate to pork belly anyway, this was a few notches above many pork belly dishes I've enjoyed of late. The picture above tells the story of quality pork served with a bevvy of amazing ingredients that cut through the richness of the meat. Also amazing was the Duck, carrot, cumquat and yuzu marmalade,fennel and fennel seed labna served with Grenache Rose 2012 by Frank Fawkner and Hugh Holland. Perfectly cooked duck and carrot with creamy Middle Eastern labna. All cudos to Phee Garner and Appetite for Excellence and Electrolux and sponsor partners for promoting the current emerging stars and future of the Australian culinary scene. After a series of stellar dishes I enjoyed this Slow cooked beef Bourguignon with sauteed pine mushrooms, served with Barossa Valley Esprit Blend 2010 and prepared by Michael Cole and Matthew McNamara. The beef was the hero and just melted in the mouth, easily pulled apart. The rich gravy was so perfect, as was the presentation with garnish. The French would be proud of this classic. Another highlight was to chat with Oliver Gould the Head Chef at Stokehouse in Melbourne. Oliver is enjoying the Modern Australian cuisine at Stokehouse with dishes that stand out in an atmosphere of casual fine dining. He's been at Stokehouse for about 8 years, which is a great story in itself as many Chefs move around from one place to another. Desserts kept up the high standard with this Tart of rhubarb, rose geranium and burnt vanilla served with Iced tea, prepared by Josh Niland and Sonia Bandera. The fruit shone out in this dish and tart was perfect. The iced tea was in fact a superb cocktail to complement. Finally the Banana, popcorn, curd, hazelnut and chocolate dessert was a fun dish with elements combining perfectly together in sweet bliss. Not to mention the high visual appeal. This was served with Seppeltsfield Selma Meling by Braden White and Stephanie Jacob. Another great conversation was with Karl Firla from Oscillate Wildly in Newtown Sydney. Karl excites diners with his 8 course degustation from his contemporary menu. His passion is for fresh produce and innovative cooking showing sophistication of technique. His restaurant has an intimacy about it, serving diners at one sitting for about 35 people in Sydney's inner west. What a night! This Whet Your Appetite evening will stay in the memory! Thanks to Daniel Wilson and Huxtable for opening up his restaurant and kitchen so generously! And again to Electrolux (who are global giants in the commercial appliance scene and check out their Cube in global cities) and Appetite for Excellence! And to all the finalists and winners! I want to come to all the restaurants featured from this super talented group. Ciao!